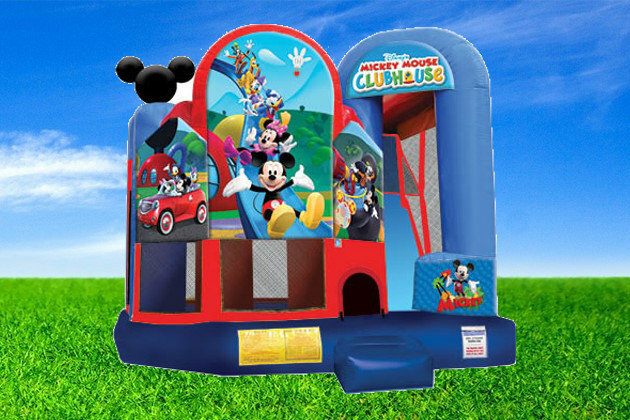 Mickey Mouse Clubhouse Combo Rentals | BounceGeeks.com Richmond, VA.
Fun awaits at the Mickey Mouse Clubhouse! What could be better than a fun time with Mickey, Minnie, Donald, Daisy and Goofy at the Clubhouse! This combo bouncer has all you need in one awesome package: bouncing, climbing, sliding, and even a basketball hoop inside! The fantastic artwork of Mickey and the gang on the outside will make this the centerpiece of your party!